Well there really isn’t a rule on how to do this. But if you’re happy with your component group, then start making some changes on how your bike looks. A lot of people will change out the color of their grips, bars, stem, seat and etc. Changing out those items is a sure fire way to give it a personal touch. Personally I like to accentuate some of the subtle colors that the bike has. For example, if my frame is orange, but the graphics like the logos are white, then I’d go with a white saddle and grips. If the bars and stem are black, I’d keep it the way it is. One of my bikes had a pretty blue frame with white letters. So I made sure I got white wheels and a white saddle as well as a white seat collar(eventually). The Moe followed the same idea with one of his older bikes. At the time there was a tire company called Sweet Skinz that sold these colored tires. They had a variety of designs that could make your bike’s appearance pop. My newest bike in the stable is all white with black logos. I decided to go with a USA theme with it. 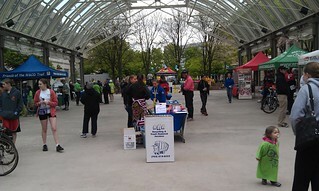 I ordered red bars, white grips, blue water bottle cage, USA flag water bottle and a frame bag that is black and blue. I thought about getting star stickers to make it more patriotic, but I’ll probably do that later on. I decided to go with a red white and blue theme. Wake Best Bicycle 780mm bar and short stem. Though my frame bag doesn’t match my cage…I’m ok with it because not every shade of black on this bike matches with each other…right? I’m going to put my snacks in there! So that’s about it…customizing your mountain bike can be as easy as changing out the colors of your accessories. Unless you get your frame painted or Plasti-Dip it, then you’ll have to work with what you got, and that’s what makes it fun! A couple weeks ago, I got the opportunity to drop by the Paul’s Ride for Life event, which centers around a charity ride that raises money for life-saving organ transplants. While I found out about it too late to join in the ride (which seems like it might be a cool thing to do next year), there was also a Cyclefest event sponsored by a local shop, the Bike Lane. As part of that, there were not only tables and booths for cool local organizations like MORE and FABB (join one or both if you’re in the area! 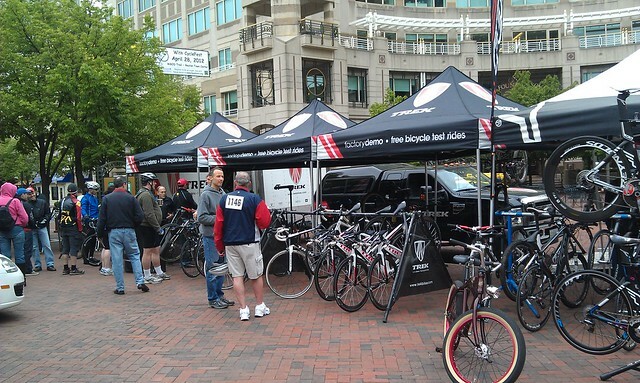 ), but demo bikes on hand from Niner, Felt, and Trek. I got to try out the Trek Superfly Al (geared) and the Niner S.I.R. 9 (singlespeed) for a few minutes each. 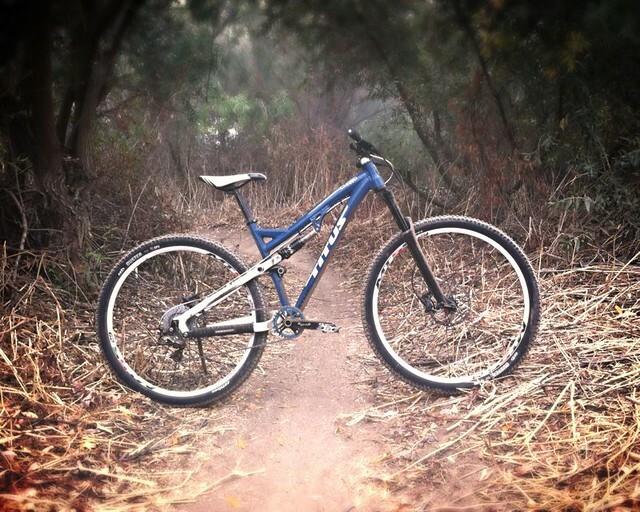 I tried the Niner first, and man… it was a fun bike! You can probably trust the word of a man who owns one more than mine, but in the few minutes I got to tool around on it I was very impressed. The geometry felt really natural – the bike was responsive without being twitchy – and it didn’t feel too hefty despite the steel frame (853 Reynolds, for those who might be wondering!). When I got on the Trek, I noticed immediately that it had a different approach than the playful Niner. The Superfly (in all editions) is billed as a race-oriented XC bike, and it shows in how it rides and handles. It was a nice bike, but I didn’t really get that grin on my face that I look for when testing a bike out. To be fair to Trek, part of this may have been because the brakes on my test bike were REALLY dirty and noisy, so I was distracted by that for much of my ride. This was my first real experience testing out multiple bikes at a demo event (I was supposed to have a 2nd a couple days ago, but it got rained out), and it was a lot of fun! I’m sure many of you do this when you can, but I’d encourage everyone to attend demos when possible – it’s an easy way to check out one or several bikes fairly quickly, whether you’re looking for a new ride or not! Does Storing Your Bike Upside Down Lead to Fork or Brake Issues? More of a question than an article on this. I wanted to see if you, the readers, have had any negative experiences with hanging your bike upside down from the ceiling of your garage for storage between rides. Here is my experience with this issue: I used to hang my bike upside down and although I never developed any problems with my Rock Shox Reba fork, I did notice a slight leaking issue with White Brothers Magic fork. My Avid Juicy 7’s were fine as well. Once I began storing the bike vertically along the wall, the leaking issue vanished. Currently, I only hang two bikes upside down: 1. my singlespeed commuter with rim brakes and steel fork and 2. my wife’s cheapie Gary Fisher with rim brakes and a low end fork… which surprisingly has not leaked, but then again it doesn’t work very well either. I ask this question not because I’m exploring this option again but because a good friend of mine hangs his bike upside down from the ceiling and his year old bike with a nice Fox fork is starting to leak badly. I know many of you will say for him to keep it right side up, but his garage is packed with work (owns his own business) and family related stuff. 1. Do you have any experiences, particularly negative, hanging your bike upside down from the ceiling? 2. Do you know if certain fork or brake manufacturers are better at being hung upside down? 3. 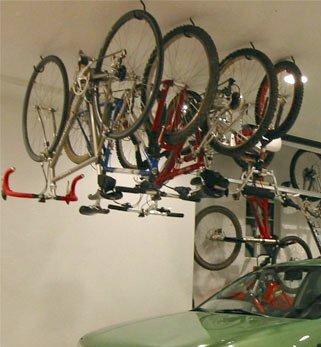 Any elegant, space efficient solutions for storing a bike right side up from the low ceiling in a garage? Those pulley systems seem to take too much room. Rl and I hit the loop for a quick short ride to “feel” and do minor adjustments to the Soul Cycles Dillinger. After a few quick saddle and seatpost adjustments, we were ready to hit the trail. OK, so let’s start with the geometry, the bike felt “big” as in tall, but I was not stretched out. I found this “bigness” to be an advantage on the quick and short steep downhills, I never felt as if I was going to fly over the bars. Climbing off the saddle, I didn’t feel any flex, the bike was solid. The Reba Race’s poplock remote was very convenient, just a flick of the switch and the fork was almost fully rigid. At 35 psi, the Geax Saguaro Tires struggled for traction on the loose terrain, especially on the uphills. I will play around with the tire pressure to see if I can achieve more traction, I usually run my 29er tires at 30psi. The Powercordz brake cables felt amazing, I’d forgotten that I was riding mechanical brakes and not hydraulics! Quick note on the Serfas Tegu saddle… COMFORTABLE, even RL noticed it when he was riding the Dillinger for a bit. I’m hoping to put a lot of miles on this bike, I really need to get in better physical shape and I find that riding a Singlespeed is one of the fastest ways to do it. 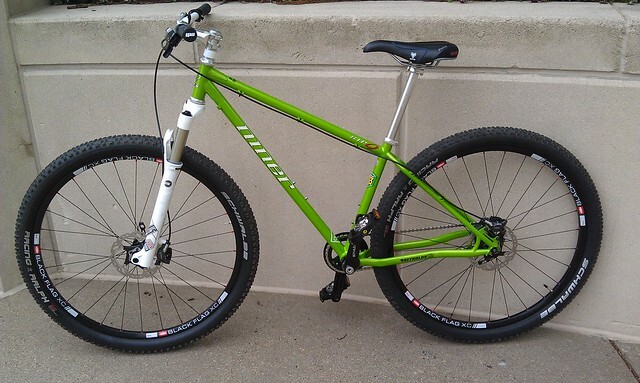 I will write a full review of this bike in about 2 to 3 months. I did it. I jumped on the single speed bandwagon. I suppose it was just a matter of time really…with all these boys around me on their single speeds. I swore I’d never do it. But I really just couldn’t resist. I was blown away when I first saw RL riding his single speed. The guy actually rode faster on a single speed then he does with gears! Most recently Jeremy built up his single speed and before that I saw David decide to give it a go. Now he is racing ss! I just didn’t understand what all this excitement was about? Why the self-torture? I like all my gears, especially my granny gear as needed. RL has been trying to get me on a single speed for a long time now. I really just had no desire but my curiosity peeked and I said to RL “Well maybe I’ll just give your single speed a try one of these days – but no strings attached! If I don’t like it I don’t want you to ask again.” That’s all he needed. He had me out on the fully loop in a matter of days on his single speed. I really didn’t know what to think of it initially. The bike was all wrong of course for my body but I kept this in mind as we put in a few miles on it. I felt very frustrated with not being able to climb a few hills but the flats were fun. I felt like a hamster turning in her wheel at times and other times the pedal stroke was effortless, yet I moved so fast! So after a couple of runs RL suggested building up my beloved Motobecane as a ss for me. The chance to saddle up on the Motobecane again??? Yes! And the best part was I got to pick the color of my chain! How COOL is that?!?!?! My KHS is decked out in pink so I thought purple would be a nice change. I’m all about comfort so we threw on my Ergon grips and a nicer saddle. We thought it best to stick to a 32-18 for now. I have been secretly riding the single speed for about 4 weeks now. Why secret you ask??? Well first off, I didn’t want the boys to know in case I completely hated it and gave up after 1 ride. lol. It’s also really embarrassing not to be able to clear some of the hills out there – yes I have got a little pride. Oh c’mon you know we all feel a little bad sometimes when we have to dismount. I know I am not the only one. But I am over it, because I still can’t clear some of those hills! lol. 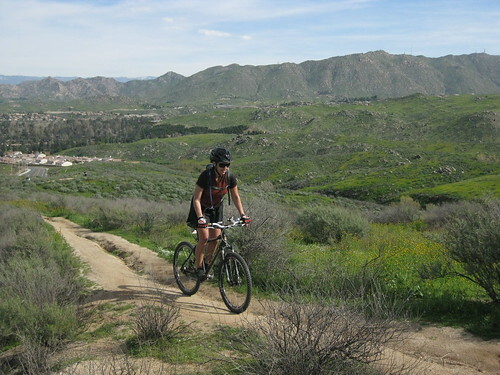 This past weekend was my first “group” ride on the single speed out at Sycamore Canyon (ride report to follow). I don’t know WHO said this trail was single speed friendly (RANDALL), but in any case I survived. LOL. We got in a little over 15 miles and I am happy to say I still like it. I love that there is so little to think about on a single speed. I don’t have to give any forethought to which gear I want to be in, I just have to adjust my pedal stroke. The boys thought I was showing off when I was zippin up the hills but, really, I just need A LOT of momentum to get up. I still find the short steep climbs very difficult, which is a blow to my ego..lol….but I hope in time I’ll build up my muscles to clear these. There is also something familiar about the set up. It feels very similar to my spin bike, which I am on about twice a week. It’s really hard to describe the enjoyment I feel on that bike. Maybe it’s becuase it’s a new experience? Maybe I like the extra power I feel in my pedal stroke? Or maybe I just am happy to be reunited with my moto. I don’t know what it is, but I like it. The single speed set up is also an incredible work out. I’m not just talking about my legs either. My arms and shoulders are still talking about it a day later! Maybe riding single speed will make me more fit?? Maybe that’s the animals secret?!?!? Well I’ll let you know in time! Ha! I am also curious to know if it will improve my riding on my geared bike? As many of you know, we recently added the Sette Razzo frame to our lineup of bikes here at mtnbikeriders.com WCH. The Sette Razzo was built up as a SS. I have to admit, I was, and still am, very tentative about riding a single speed. I probably got that way due to all the Moe & RL puke stories. I, like many of you, are not a fan of puking. I decided to hit my local test loop, the Fully loop, for my first ride on the Razzo SS. The loop starts off for almost flat with just a twinge of an incline. I immediately felt the desire to shift gears and go faster, so much so that my right thumb twitched. Of course, there was no gear to change into so I ended up spinning really fast here and there. But I wasn’t used to all the spinning and my legs quickly got tired of it. I’m going to have to work on that part of SS riding. What I was really afraid of were the climbs. None of the loop climbs are particularly long, about the only thing the loop is missing, but some are on the steeper side. The first short quick steep after crossing Euclid was conquered without any issues. Rolling along the street after the climb was a bit annoying because again I couldn’t get my legs to spin up fast enough. But ahead lay the climbs and as much as I was annoyed by all the spinning out I was cognizant that the lower gearing would be greatly beneficial on the climbs. The climb that really got me antsy begins with a mild fireroad ascent. It then rolls along a little before hitting a short rooty section followed by a short steeper section. The end of this is a little past the halfway point of the loop. No puking on this climb. I was close… but I held it down. One more climb which is made difficult with railroad ties was up next and only my pride plus the presence of a couple of hikers stopped me from letting it flow. What I came to realize over my SS ride was that my body had built up a bit of a familiarity to sustained standing climbs which is really your only other “gear” when you’re riding a SS. 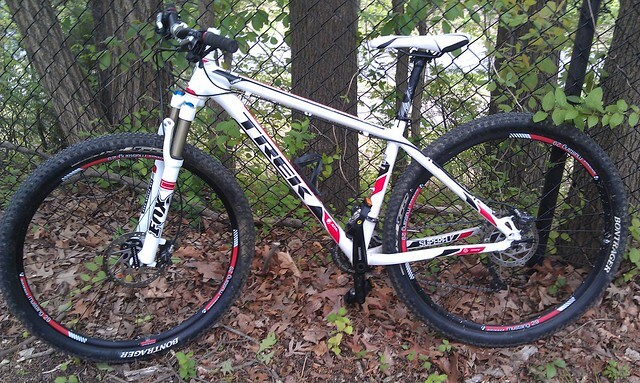 The familiarity was achieved when I began riding the Redline Mono 9, a 1×9 geared 29er. Before the 1×9, I would sit and spin my way up but when I rode the 1×9 consistently I realized that if I sat and spun all the hills, I’d quickly run out of gears. So I adopted a different approach to climbing that included a mixture of spinning for a while then climbing while staying in the same gear. For example, if I was in gear 4 on a seated climb and I felt I wanted to change gears, instead of choosing to shift I’d stand up and climb for a bit. This essentially doubled the number of “gears” I had available to me from 9 to 18 and also eased my transition from 27 gears down to one. Being comfortable with sustained standing climbs turned out to be a great help when I rode the single speed. I truly believe that if I went straight from 27 gears to just one, I probably would have joined RL & Moe with puke stories of my own. This week I worked on right-sizing the steerer tube on my carbon fork and the width of my handlebars. On my last update (#1) I wasn’t quite sure which handlebar/stem to use. I’ve decided to give the KORE Torsion Bar and B52 stem a try. Stock length of the Torsion Bar was at 800mm, so I’ve got some work to do in shortening it. The FORK: I finally got the courage to cut the steerer tube myself. As I mentioned on the last post, the steerer is also carbon fiber. Not having cut a steerer tube in the past I was hesitant in doing so. For awhile I was debating on whether I should do it or take to my LBS. Always trying to be self-sufficient I did a little research then bought a hack saw at Home Depot. Following Richard Cunningham’s (Mountain Bike Action, issue July 2007) instructions, I measured the desired length then taped a spare aluminum spacer to use as a cutting guide. I added an extra 10mm spacer to my desired length to give myself a little room for error. Fortunately all worked well and the steerer tube was cut evenly. I reinstalled the fork, added my carbon spacers, tightened the stem then installed the compression plug. Spacer taped on as a cutting guide. NOTE: do not use the regular star-nut with carbon steerers; it will damage the insides. Use a compression plug which will expand inside the steerer tube. The HANDLEBARS: Using the same method above, I proceeded to shorten the Torsion bars. Original length is 800mm. I decided to take off 3/4” on each end. After measuring the desired length, I marked the handlebar, clamped on an old set of ODI Lock-on rings for a guide, tightened the screws then cut away. Final length is 30.25″. Once I’ve mounted the stem and handlebars to the appropriate position, I installed the red Oury grips. ODI Lock-on rings as a guide. As we all know, Eric Hunner has earned a nick name of being the ANIMAL because of his ferocity and his massive size of man. Plus he’s got these gigantor hands that surprises anyone that shakes them. We’re pretty lucky to have him part of the team. 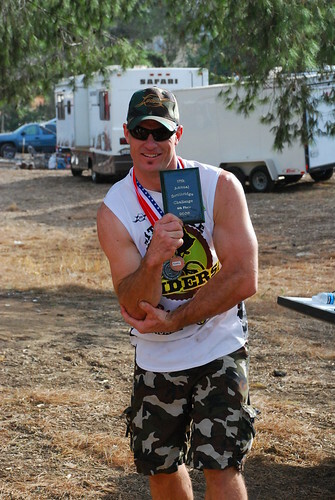 As in traditional fashion, Eric wrote a race report that talks about the world of Single Speed Racing. Race Day is not just a day for me, it is an event that is weeks in the making. I think of these races as a report card to myself to see how my riding is progressing and where I stand in the pack of local riders. In order to get good grades on my report card I had better do my homework. Southridge was the last stop in the Triple Crown for our Team. I was the only person on the team that had not ridden Southridge before. Planning for the race included making time in my busy schedule to preride the course. Time was short, but I made it out to Southridge by 4pm two days before the race. Thankfully I left my lights on the bike from an early morning training ride. The sun was falling fast, I was lucky enough to run into some other racers that were packing up to leave, and they pointed me in the right direction of the trail head. The trail head consisted of little orange arrows spray painted on rocks to lead you on your way. Some of the arrows are are far apart so preriding this course is a bit of scavenger hunt especially when the sun is going down. When making my way back to the parking lot I ran into Griffith Vertican. I proceeded to ask Griffith questions about the course and he was nice enough to show me some of the turns I missed on my preride, we ended the tour with some high intensity sprints up the hill to the water tower. Saturday: Race Day. I am entered in the 34 and under Single Speed. I am sitting at the start line and I hear RL Yell out Go get those skinny guys Animal. The race starts I am amped, and feeling good. All of Single speeds left 5 minutes after the pros, at least ten SS together riding in a pack all pretty even paced for the first mile. The terrain at Southridge can be tricky rocks and ruts that are not avoidable, you need to be on your “A” game. I make it though the race almost without any problems. On the second lap after some jarring downhill sections it feels like I am pedaling with the rear brake dragging. 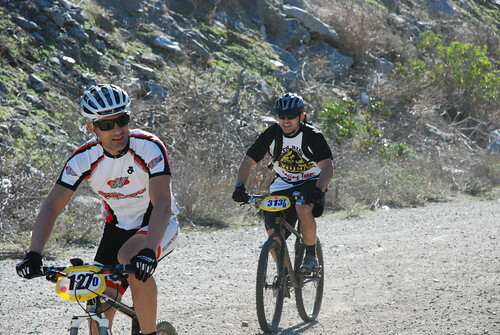 I try my hardest to just pedal and try to keep some distance in front of Andrew a fellow competitor in my class. I later discover after the race my rear SS specific hub was letting its life slip away, another rear hub with trashed bearings. Now my other problem surfaces; holding off Andrew with my rear hub sucking the life out me. Andrew was geared a little faster than me I think he said he had to walk the hill in the back of the course, I was able to pedal up this nasty hill running 32/18. When the two of us hit the flat straight he pulled ahead, until the last major hill climb I pushed my bike and body to the max, I took the lead and held it until 10 yards from the finish line. Andrew tried to pass in the last turn of the finish and crashed into the racers in front of us, then tangling handle bars, pedals, and plastic fencing together with me he got out of the fencing first. The difference between 3rd and 4th place ONE second. I ended up in 4th place, Andrew apologized for the mix up at the end. I kept my cool and was glad I finished the race in one piece. I did however collect a very nice Trophy for the 2nd place overall Single Speed in the Triple Crown Series. The www.MTNBikeRiders.com Racing Team made this enjoyable team experience possible with all of our sponsors help in supporting us. A while back I did a review of the Yess Pro Full Suspension Single Speed Tensioner. At Interbike, we met up with Yess Pro and they showed me one of their other tensioners and I asked if we could test it, they agreed and handed me a unit right there. This is the ETR-B, its a bottom bracket mounted tensioner. I wanted to try this baby out because I want to make my drive train look cleaner and eliminate the tensioner that hands from the derailleur hanger. The ETR-B is adjustable to ensure a perfect fit and tension. Once I get it installed, I’ll report back on the performance. After reading Eric Hunner’s article about single speeding, he and I had a conversation about rigid single speeding. I had many questions to ask him about how it feels, which fork to get and anything else I could think of at the time. So after looking around for an affordable fork, I decided to go with the KHS Rigid One fork. This thing is made out of good old steel, so that means its going to compliment my Red Rocket Single Speed (old Gary Fisher steel bike). Scheck it out mang, if I wanted to, I can install Disc Brakes on my single speed. Now I have to cut the steerer tube down and install a star nut, but it should be ready this week.